With that, it’s possible to run all the stuff in $GROOVY_HOME/bin, e.g. the groovyConsole on the N900. It terribly slow, the groovyConsole takes abount 60 secs to come up, the keyboard has a very long lag when typing – but it works! Anyone else got a ‘groovy’ smartphone? 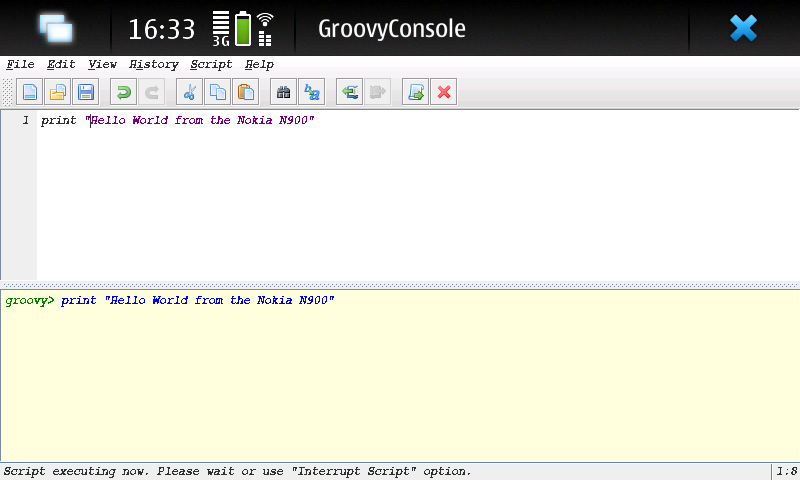 I installed groovy too on the fantastic n900. Only I have Icedtea6 directly from the repository Maemo extras-devel (or Maemo Extras) and it works well. groovyConsole is painfully slow, but groovysh works with no problems! Luigi, thanks for the info. At the time of writing, icedtea was not available in the repos. I’ll install it asap.